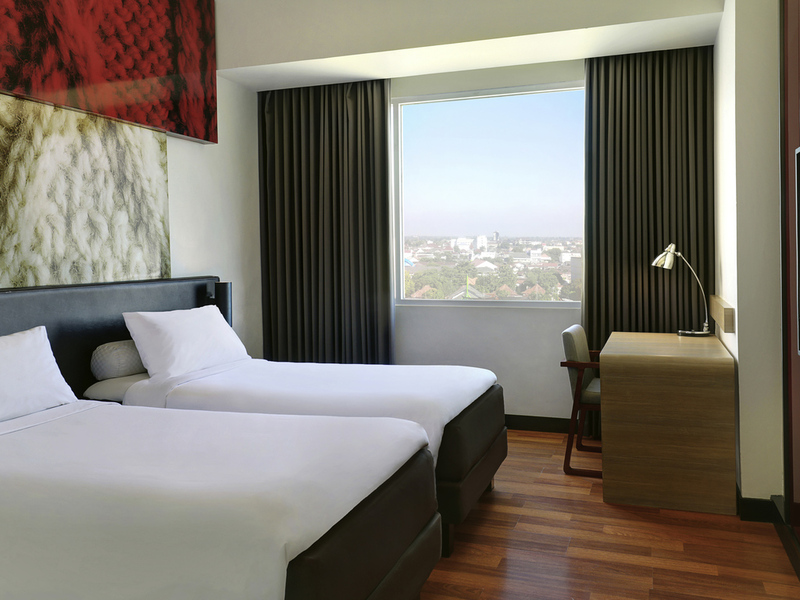 ibis Yogyakarta Malioboro is ideal for both leisure and business travelers looking to stay in the heart of Yogyakarta city. I look forward to welcoming you to ibis! ibis Yogyakarta Malioboro, strategically located at Malioboro Street and connected to shopping mall, is ideal for both leisure and business trips. You won't feel cut off with our free high speed Wi-Fi. In your 24 sqm room, your Sweet BedTM, the ibis bedding solution, brings you ultimate comfort for a great night sleep. Enjoy a smooth stay with our contract "15-minute Satisfaction Guarantee". Experience our tasty Oxtail Soup in our ibis Kitchen Restaurant and enjoy the Malioboro sunset from ibis Bar. A rich cultural and historical city, Yogyakarta has plenty of tourism attractions to visit such as Benteng Vredeburg, Keraton Yogyakarta, Tamansari Watercastle, beaches, Borobudur Temple, and Prambanan Temple with its Ramayana ballet performance. Standard twin bed. This 24 m² modern room is well equipped and features two single beds. Standard Double bed. This 24 m² modern room is well equipped and features a queen bed, LCD TV screen, separate bathroom with standing shower and free WiFi Internet access. The right choice to feel great. A convivial buffet featuring traditional cuisine. Simply a pleasure. Our bar is a friendly place where to meet and relax at any time. Enjoy a wide selection of drinks, beers and aperitifs, and because there is no time for small hollow. we can prepare a snack at any time to eat at the bar or take in your room.